The European Union has previously mandated that you shall buy Guarantees of Origin to document and report renewable energy consumption in Europe. The current reported volume is 499 TWh, but this is expected to increase by an additional 10 TWh, when unreported German Q4 figures are included. This will push the expected total demand for renewable electricity documented with Guarantees of Origin close to 510 TWh. This represents an impressive 8% increase from 470 TWh in 2017. The demand for renewable electricity continuous to show robust growth in Europe’s biggest markets. The Netherlands, France, Switzerland and Italy show record high demand in 2018. The French market demand increased from 21 TWh to 33 TWh in 2018, while Italy sees record demand of 45 TWh compared to 41 TWh last year. Although the final numbers have not been published for Germany yet, they are in line to exceed 100 TWh for the first time. Wholesale prices for GOs averaged around 1.30 €/MWh in 2018, while Nordic hydro GOs traded as high as 2.29 €/MWh. This indicates that the market is willing to pay higher prices even though demand did not grow quite as aggressively as in 2017. With demand for renewable power now exceeding 500 TWh, and forward prices set at around 1.30 €/MWh, the annual value of the market exceeds 650 MEUR. If growth trends continue we can safely predict that this will be a billion Euro market in a few years. Although hydropower is still the greatest source of renewable electricity, preferences are gradually shifting towards alternative renewable sources, with wind power being “the technology of choice”. As 2018 figures are updated and reported later in 2019, these shifts will likely become more pronounced. These changes in demand may not only reflect changes in customer preferences, but also reflect changes in market availability for different technologies. Households, organisations and businesses all contribute to the market growth. But the corporate sector is the main driver because more corporations see sustainability as necessary for future competitiveness. Several initiatives exist to support corporate sustainability ambitions. Two notable initiatives are WeMeanBusiness and RE100. The RE100 initiative now has 161 corporate members that have all publicly pledged to consume 100% renewable energy. Global reporting initiatives like CDP and Greenhouse Gas Protocol are enabling this movement. Also, the EU recently approved a new Renewable Energy Directive (REDII), strengthening the GO system by further embedding it in European legislation. 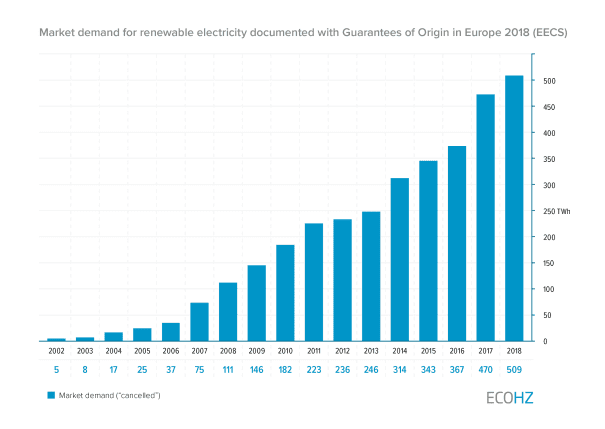 “The Guarantees of Origin is the primary tool in Europe to document the purchase of renewable energy and REDII represents a major step forward in strengthening the system of Guarantees of Origin,” says Tom Lindberg. The above is a commentary based on figures published by AIB (Association of Issuing Bodies). Many of the AIB member countries have deviating reporting schemes, and therefore the statistics are not fully complete at this point in time. Updated figures will thus contribute to strengthen the aggregate figures and trends, but can potentially change country- and technology specific conclusions.